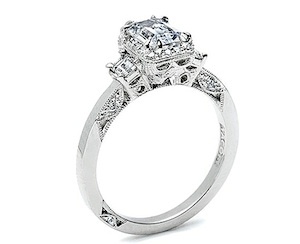 Tacori Engagement Ring 372PR is handcrafted in California, 0.73 carats of round stones are set along the band of this French cut style setting with a square shaped bloom adorning your choice of a princess-cut diamond at the center. 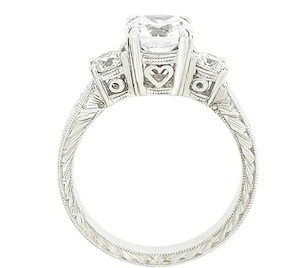 A signature Tacori crescent adds the finishing touch on the band. 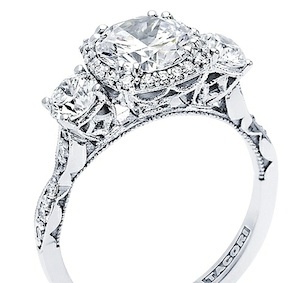 A true dream come true for any Tacori princess. 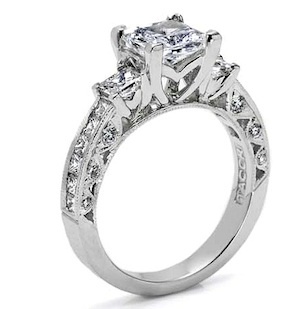 With big brilliant round spotlight diamonds surround the princess cut center stone, this Tacori engagement ring HT2605PR is absolutely flawless. 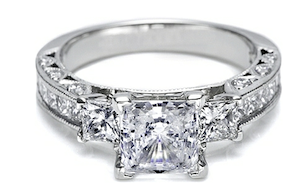 For a mega-diamond look this engagement ring will truly take your breath away. 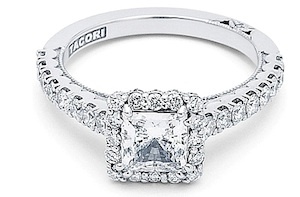 Tacori signature crescent silhouette lines the profile for a stunning design to last a lifetime. 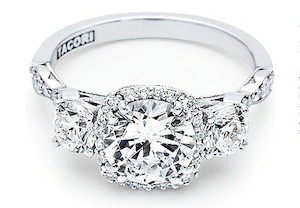 The Tacori Engagement Ring 542CU is a single stand of diamonds surrounding the center creating a bloom…adding even more romance to this sparkling beauty. Our iconic crescent design decorates the profile of this ring allowing windows of light to shine through from every angle. There is truly not an inch of this ring that was left untouched. From the marquis shaped design along the ceiling, to the diamond encrusted profile creating sparkling reflections anyway you look at it. A beautiful juxtaposition of modern, yet traditional; classic, yet unconventional. 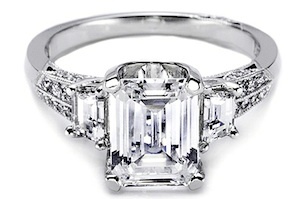 This stunning Tacori Engagement Ring 2621EC will beautifully show off your center diamond with diamond enhancers blooming the stone, flanked by emerald-cut side stones. 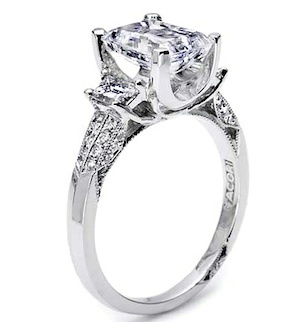 This gorgeous setting is also available in Medium or Grande proportions and with pave shoulders as well. 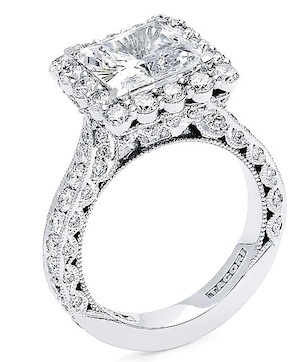 This Henri Daussi Diamond engagement ring, H11, is featured with a split shank band with pave set diamonds. 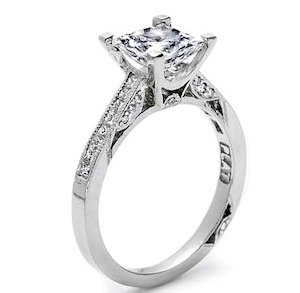 In the center is a diamond of your choice with a diamond halo around it. 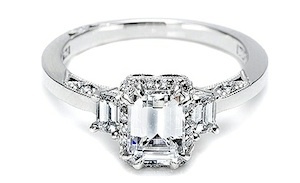 Step it up with a unique and bold emerald-cut solitaire with two trapezoid-shaped side stones. 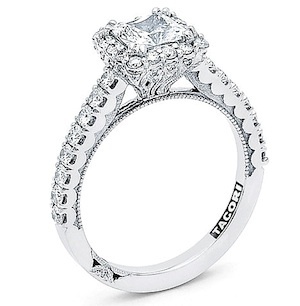 Tacori Engagement Ring 2579EM, has a high-polished knife edge band and set with dazzling rows of pave. 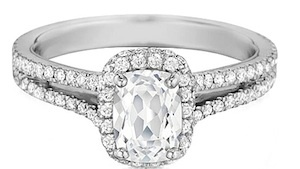 The classic style Tacori engagement ring # 10936 features a round brilliant cut diamond on either side of your center diamond. 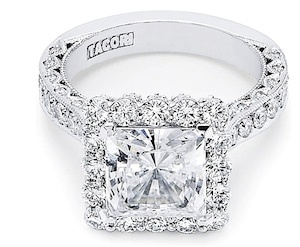 This three stone setting by Tacori is simply beautiful. 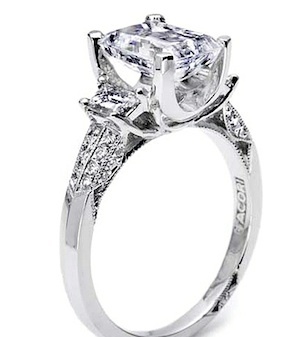 This stunning Tacori engagement ring 2430 features a princess cut diamond on either side of your center diamond. 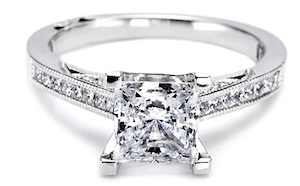 In addition the band contains smaller princess cuts which are channel set round brilliant cuts which are pave-set. 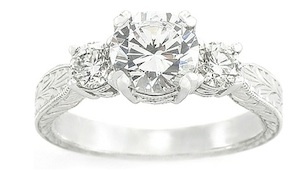 The ring is currently priced with the diamonds going half-way around the band 1.35ct tw as pictured. 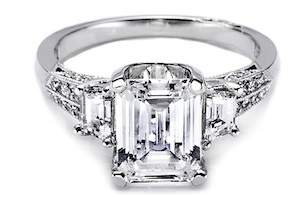 This beautiful Tacori Engagement Ring 2579EM is a unique and bold emerald-cut solitaire with two trapezoid-shaped side stones. 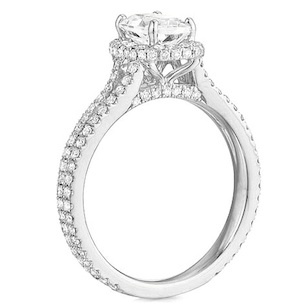 The high-polished knife edge band is set with dazzling rows of pave.